How do you do better than other Aston Martin Valkyrie owners? Sprinkling some moon dust as part of the paint job on car should do the job. 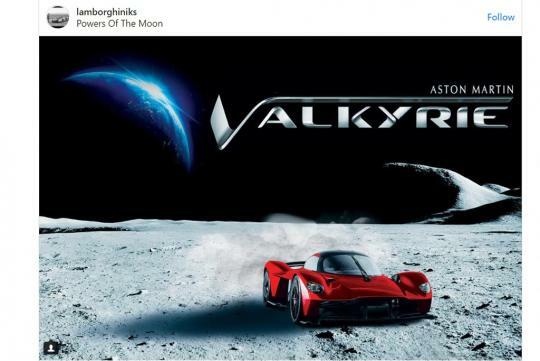 According to Instagram user Lamborghiniks, the successful entrepreneur took to social media to reveal that he has purchased a rock from the moon and will have it ground down to dust and used in the hypercar’s Karosserie Lunar Red paint. We aren't sure how it will turn out but you can be pretty sure his car is going to be pretty unique. It is said that the well-to-do entrepreneur also owns other exotics such as a Pagani Huayra BC, Lamborghini Veneno, Koenigsegg Agera XS, and more. Set to be the highest-performing Aston Martin, the Valkyrie will get a naturally-aspirated 6.5-litre V12 engine that will output around 1,130bhp when complemented by battery power from Rimac. With state-of-the-art aerodynamics, its lap times is said to be able to rival a Formula One car. I think he's trying too hard. If he wants something unique for his car why not get a coe?